The other day, I sat in my dream car. Sigh. Motor Trend’s Car of the Year. Sales guy: Do you have any questions? Me: No, I’m just drooling. Sales guy: *Puzzled look* then *hearty laughter* That is the best answer I’ve heard ever! Husband: Get the girls through college first. 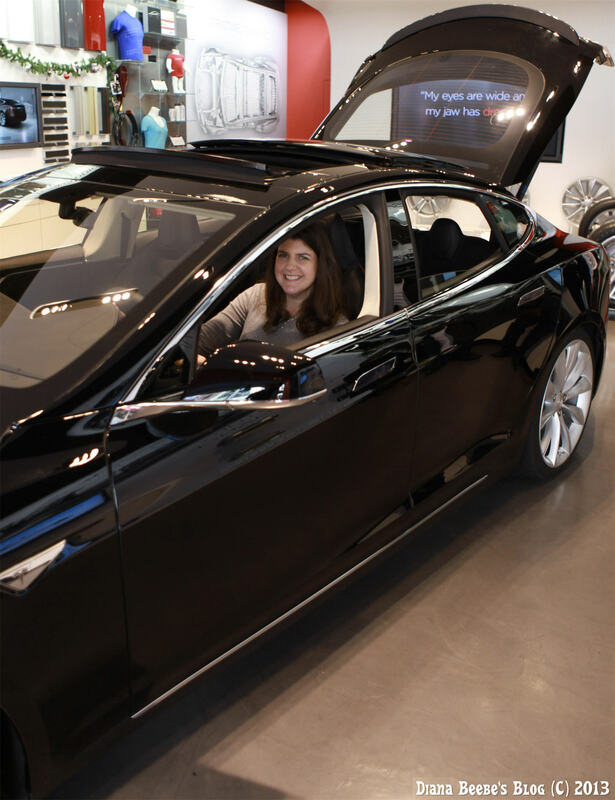 I left the Santana Row Tesla Motors Design Studio willingly and with most of my dignity intact, much to my husband’s relief. I’m sure he had visions of my hanging onto the sleek, beautiful hood and clinging to it with desparation while begging for the sedan to return my love. Could I invite myself back on the day he gets his beautiful, sleek Model S, so I could drive it? And maybe pull a couple of fuses. You must watch the video toward the bottom of the article. My friend sent me that link with the note “For your drooling pleasure.” I have it bad, don’t I? Truthfully, I would be terrified to drive the car in that manner. It reminded me of when I drove the Tesla Motors Roadster. As if that’s not bad enough Tesla Motors also has the Model X. The ultimate crossover with the coolest doors ever. My seven-year-old hopes that I’ll get that one so she can drive it someday. Keep dreaming, kiddo. You will not be parking that in a high school student parking lot. I’ll keep dreaming, too. I’ll try not to drool. No promises. What’s your dream car? Have you ever owned your dream car? What feature do you love about cars?